It is important that key stakeholders agree on the main purpose or purposes of evaluation, and be aware of any possible conflicts between purposes. 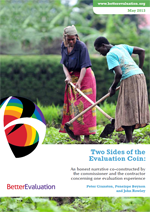 The purposes of an evaluation will inform (and be informed by) the evaluation timelines, resources, stakeholders involved and choice of evaluation options for describing implementation, context and impact. It is not enough to state that an evaluation will be used for accountability or for learning. Evaluations for accountability need to be clear about who will be held accountable to whom for what and through what means. They need to be clear about whether accountability will be upwards (to funders and policymakers), downwards (to intended beneficiaries and communities) or horizontal (to colleagues and partners). Evaluations for learning need to be clear about who will be learning about what and through what means. Will it be supporting ongoing learning for incremental improvements by service deliverers or learning about 'what works' or 'what works for whom in what circumstances' to inform future policy and investment? Purposes of Assessment - Keystone Accountability. This discusses six major reasons why social organizations monitor, assess and report on their performance and results. Seeking Surprise: rethinking monitoring for collective learning in rural resource management- Irene Guijt. This discusses nine different learning purposes, and how monitoring and evaluation systems can be constructed to support them. Utilization-Focused Evaluation - Michael Patton. The UFE approach is based around identifying primary intended users and uses and basing all decisions about the evaluation on addressing these. It includes a discussion of possible intended uses.